Forget sabering Champagne. Watch this guy sniper it. Experts had previously determined that hacking off the top of a Champagne bottle with a sword was the "sickest" way to uncork bubbly. But they might have to amend their findings thanks to FullMag's Richard Ryan. 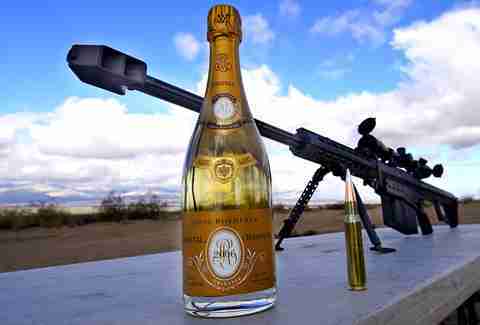 The YouTube star (and ace shot) challenged himself to open a bottle of Champs with his .50 caliber sniper rifle in honor of New Year's Eve. He obviously nailed it, and then proceeded to set off some confetti bombs in celebration. Watch the whole grand experiment above -- just don't get any wild ideas about a bottle of Andre and your old BB gun tomorrow night. Kristin Hunt is a Food/Drink staff writer for Thrillist, and can barely open a bottle of Champagne the normal way without hurting herself. Follow her to remedial uncorking school at @kristin_hunt.